Gaining popularity in Singapore weddings, a flower bar looks really beautiful at your wedding, and is great fun for your guests! Check out these 13 gorgeous flower bars in Singapore for a wedding that blooms with beauty. Looking for a fresh and fun element to add to your wedding so your guests have a great time? A floral bar might be exactly what you need! An interactive station, flower bars are filled with flowers and foliage that your guests can select and arrange into their own bouquet to take home. In addition to fresh flowers, some florists offer dried potpourri bars, fresh floral crown bars, or succulent bars so your guests can try something different. With their beautiful colours and pretty styling, flower bars are fun for your guests AND look beautiful at your wedding—win win! We’ve rounded up some of the island’s most beautiful floral bar providers so that you can find the best blooms for your celebration! 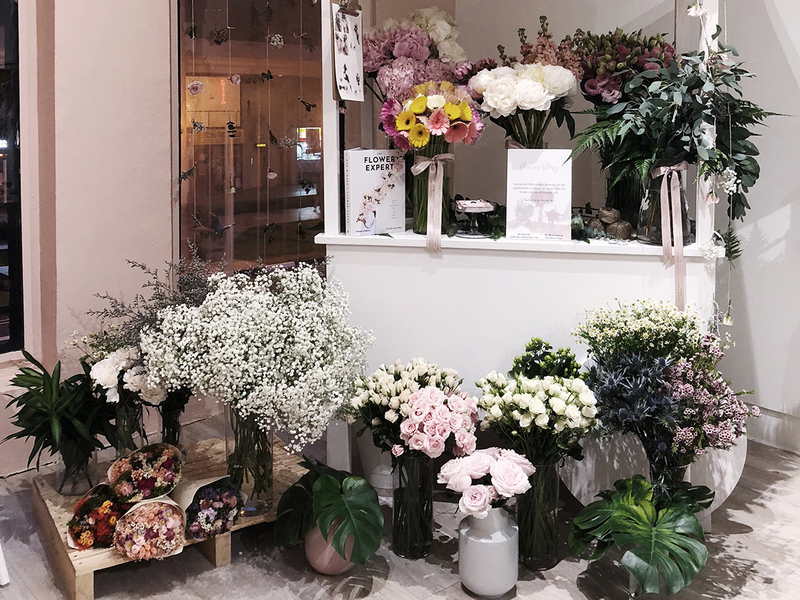 Most of the florists listed here offer customisation services, so whether you want a flower bar in your wedding colours, or only want foliage for a botanical wedding, do speak to them about your wedding theme and budget in order to work out a flower bar that’s right for you. Believing that flowers make wedding moments more beautiful and memorable, Florals Actually offers all manner of floral services, from floral bars to everyday bouquets, and hope to always give you a floral experience that’s uniquely yours. Exclusively for SingaporeBrides readers, quote “SingaporeBrides” to enjoy 10% off flower bar services by Florals Actually! A husband and wife team, HellofromFlour are fine art wedding designers who love celebrating weddings with beautiful space styling, florals, and cake and desserts. Flower bar Singapore prices from: $600 for min. order of 80 guests, inclusive of 5 types of flowers, 3 types of fillers, 2-3 flowers and fillers in simple brown wrapping for each guest, 2 florists on hand at the floral bar, 1.5 hours flower bar service, or until flowers are gone. Credits: Images courtesy of respective florists unless otherwise stated. Feature image of Flower Story, cropped from original.